Until the mid-19th Century Swindon was little more than a village on top of a hill in rural Wiltshire. However, in 1841 the directors of the Great Western Railway announced that they intended to provide an engine establishment at Swindon, and so began the growth of the railway town. 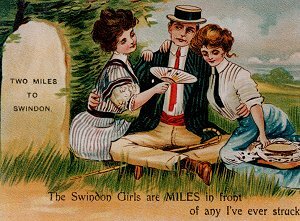 In 1841 the population of Swindon was just 2,495, but, as the GWR works expanded and the area became a magnet for labour, by the turn of the century Swindon had assumed the appearance of an industrial town with a population of about 45,000. At the outbreak of the First World War the railway industry had reached its zenith. The GWR works employed about 15,000 persons with another 1,000 employed on the railways themselves. It is estimated that three in every four jobs in the town at that time were in the railway industry, with most others indirectly dependent on it. The 1920s and 1930s saw the beginnings of the mass-production of the motorcar and rapid growth in road transport heralding the end of the railways as the principle means of land transport. Ironically, it was the production of motorcars that would spearhead Swindon's post-war recovery and it seems likely will remain an important element of the local economy for the foreseeable future. During the early 1940s war production brought new industries into the town and an increase in population after a decade of stagnation. However there were severe accommodation problems with many living in prefabricated units that would need replacement after the War. In the immediate post-war period, as a response to the need for more housing, development occurred at Moredon and later at Penhill. In the face of decline in the town's main industry, the attraction of new industries and new people was seen as the town's only means of escaping from decline and depression. The Town Development Act of 1952 would provide the legislative framework by which agreements could be made with London local authorities to receive their overspill population. Swindon was one of the few cases where the Act was used on a large scale. After the completion of Penhill in 1955 the builders moved onto Walcot followed by Park South a year later and Park North a year after that. By 1960 Walcot was completed and Park North and South by 1962. In addition to these local authority estates two new private housing estates were also built in the 1950s at Walcot West and Lawns. By 1961 about 13,000 people had moved to Swindon from London and the population had grown to over 100,000. Crucial to the development of the town was the attraction of new industries. In 1955 the Pressed Steel Company (now part of BMW) decided to site their new car body plant on the Parsonage Farm Site. Vickers and Plesseys also expanded their operations in the town and the first major industrial estate was sited at Cheney Manor. New housing estates continued to be built in the 1960s, at Dorcan, Nythe and Covingham to the East of the town. Also new industrial estates were built at Greenbridge and Dorcan. By 1971 the population of the town had increased to about 117,000. Swindon was one of a number of possible locations suggested for further growth in the 1964 South East Study. In 1968 the Borough Council published Swindon - A Study for Further Expansion (the Silver Report) in which a city with a population of 300,000 by 2001 was envisaged. Although the proposals were later scaled down, broadly the strategy set at that time has guided expansion over the last thirty years. The area chosen for development was to the west of Swindon. In 1971 the Borough produced its outline strategy for the area in the document Swindon - Development West of the Borough (the Gold Report). From the mid-1970s to the early 1990s West Swindon became the main area of development, ultimately housing about 28,000 people and several major new industrial estates and business parks. Initially, the West Swindon development was a mix of private and local authority housing but with a change in policy in the 1980s later development was almost entirely for owner-occupation. In the late 1980s developers started looking for new area to develop around Swindon and, following a public enquiry, The Northern Development Area was approved for about 10,000 new dwellings in 1989. Building commenced in 1995 and as at October 2001 about 3,260 new houses have been completed at the area now known as Abbey Meads. The decision of Honda to site its UK production plant in Swindon was a major boost for the local economy. Since the 1960s though, most new arrivals and business start-ups have occurred in wholesale distribution, financial and professional services and, more recently, microelectronics and telecommunications. Swindon is also home of a number of important business headquarters such as Nationwide Building Society and Zurich Financial. The railway works finally closed in 1986, however thanks to diversified economy Swindon was well able to ride through the recession of the early 1990s and is now one of the most economically successful towns in Britain. The town of Swindon is now home to a population of 157,000 and a place of work for over 100,000. The population of Swindon Borough is currently estimated to be about 182,000, of which 157,000 reside in the town of Swindon itself. The other towns within the Borough are Highworth (pop. 8,200) and Wroughton (pop. 7,100). The population of Swindon Borough has doubled in the last fifty years; this compares to a 20% increase in the population of England. In 1951 the population of the Borough was about 90,000, but by 1971 it had reached about 140,000. Continued growth mainly to the west of Swindon in the 1970's and 1980's resulted in a population of about 173,000 by 1991. Most of the population increase of Swindon Borough is a result of people moving in from other areas, particularly from the South-East of England. Initially this was part of the London overspill policy, but latterly many migrants have been attracted to jobs in the new and expanding industries of the town. The latest projections by Wiltshire County Council forecast a further increase in the population of the Borough so that the total is projected to be about 208,000 by 2011. However, this figure is controlled to house-building rates and assumes the maximum permissible number of dwelling completions. Table 1, presents the population of Swindon Borough by 5-year age-bands. The population of Swindon is slightly younger than the national average; 56% of the Borough population are aged under 40, compared to 54% for the whole of England. Table 2, shows population change by broad age groups for Swindon Borough up to 2009. Three age groups show considerable increases for the period 2000-2011; young adults, the middle-aged and the very elderly. In contrast the number of persons aged 25 to 44 is expected to be nearly static. The fall and rise in the number of young adults is the result of differing birth rates of successive generations. 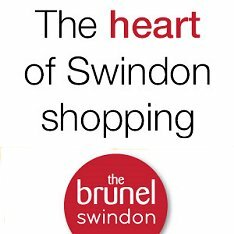 Swindon is a major centre of employment, shopping, leisure and community facilities. A population of approximately 300,000 live within 20 miles of the town centre. vProjections based on local housing development proposals contained within the Wiltshire County Structure Plan 2011 - adopted January 2001.